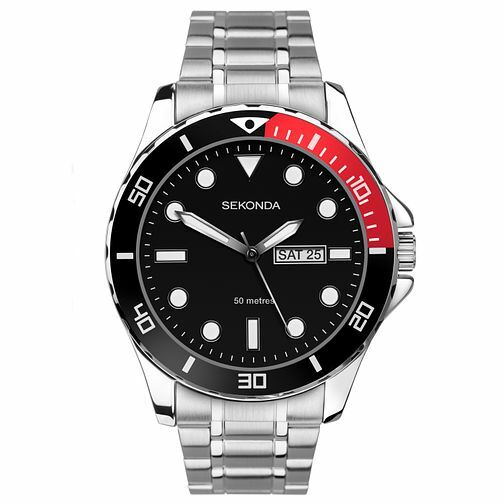 This smart Sekonda men's watch is crafted bearing a silver colour case, with a matt black dial, day and date display and a sturdy stainless steel bracelet. Sophisticated and sleek, this watch is also water resistant up to 50 metres. Sekonda Men's Stainless Steel Bracelet Watch is rated 4.8 out of 5 by 4. Rated 5 out of 5 by Anonymous from All round looks and quality I am so pleased with this watch. I bought it when it was on offer but I would have been just as pleased at full price. It has the classic sub mariner look which makes it easy to look at as well as easy to see the time day or night. The bezel is only for show but I don’t scuba dive so I don’t need it to function. It is however waterproof so the quality is there.